Try the unique Dr Pepper made with real sugar cane. 12oz cans. 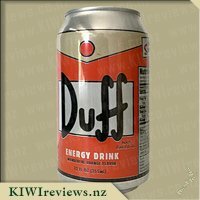 A hard to get item known for it&apos;s green old fashion can. Dr Pepper, that unique and distinctive American brand and what I now know has a distinctive taste as well. When it arrived I was surprised by the green packaging, i&apos;ve been more familiar with the red can but since this one is made from sugar cane it&apos;s fair enough that it stands out as being a little different. I popped it in the fridge and patiently (ok more impatiently) waited for it to cool. I waited for my toddler to go to sleep, pulled out a magazine and got the Dr Pepper out of the fridge. Like any good soda I gave it the initial sniff test and small sip. Sweet sugary Christmas! That&apos;s where Dr Pepper transports me, I&apos;ve heard many people say it&apos;s like Christmas cake icing and they&apos;re not wrong! That&apos;s not a bad thing, in fact to be transported to such a happy and meaningful time of year is pretty delightful! No it&apos;s not something I would buy that often but as a treat, as an escape and a way to relax and be reminded of Christmas well it ticks all those boxes! I&apos;ll definitely purchasing again when I need a pick me up and suggest you put it to the taste test as well. I love the original Dr Pepper so was excited to try this new version made with sugar, as opposed to high fructose corn syrup. The can stands out from other popular drinks as it comes in an attractive green can with yellow and burgundy stripes and has the familiar Dr Pepper logo on the front. It claims to be &apos;The Friendly &apos;Pepper Upper&apos; and has only 150 calories per can which sounds great, however, it does still have 40 grams of sugar per can! As with most fizzy drinks though, everything in moderation! I noticed when I poured the drink into a glass that it wasn&apos;t as fizzy as the original drink and smelt rather pleasantly of vanilla. When I first took a sip, I found that it wasn&apos;t as carbonated as the original, which meant that instead of my mouth frothing with bubbles, I could actually savour the flavour and enjoy. 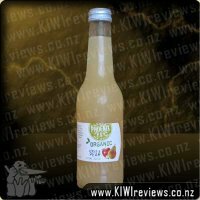 I found this drink very smooth with a subtle taste of caramel and was very easy to drink! 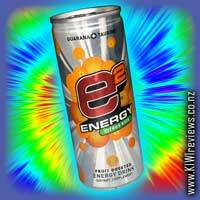 I have to say that I really, really enjoyed this drink and at $1.80 a can it was really affordable. However, it looks like I will have to hunt it down in dairy&apos;s and corner stores as it doesn&apos;t appear to be stocked in mainstream supermarkets. I would definitely recommend this as a treat and will be stocking up when I find them! 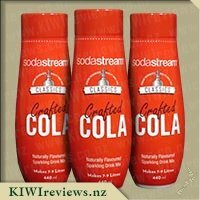 Dr Pepper is one of those brands that is known worldwide, but has struggled to gain mainstream popularity in New Zealand against the giant that is Coke (and it&apos;s lesser rival Pepsi). With Coca Cola and Frucor having contracts with most cafes, bars, and fast food outlets, finding Dr Pepper is difficult enough, and is generally restricted to the small corner dairy, or some supermarkets. This does make the brand a bit more of a luxury or treat when you come across it. 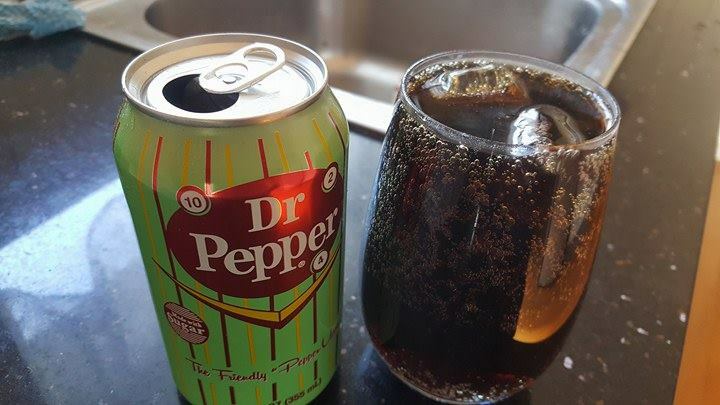 This product itself looks different to the usual Dr Pepper can, with an almost tennis ball green-yellow colour, compared to the usual "darker than a coke can" red. The different style of the packaging does draw your eyes in, and personally made me want to read the can to see why it was different. One of the things mentioned on the can which was interesting was that it mentions being made with sugar. Being made with sugar is different as most Dr Peppers have been made with high fructose corn syrup since the 1980&apos;s.
That is of course in the US. Coca Cola use sugar or sweeteners depending on the product, and this Dr Pepper product has a similar amount of sugar compared to a can of Coke (Dr Pepper has 40g per 355ml, whereas Coke has 37g in a 350ml product). So with a similar sugar content, there will be little difference between the two in regards to how healthy the beverage is, so the best judge of the product will come down purely to the flavour. Being made with cane sugar, this beverage has a much different flavour, and is much smoother on the tongue. The carbonation level doesn&apos;t seem to be quite as high as other similar products so it feels much less acidic. The flavour is similar to that of a Cherry coke; a fruity cola, with a smoothness that feels like it includes a hint of vanilla. An enjoyable flavour that isn&apos;t overpowering or harsh. Overall I very much liked the flavour, and the lower level of carbonation (while reducing acidity) also increases the strength of the flavour, as you actually get more of it on your taste buds (rather than buffered by a sea of bubbles). At its current price, this is exceptional value for money, but still is a high sugar product so something to be taken in moderation. Growing up watching American TV you would have to of lived under a rock to not heard of Dr Pepper. Pretty much my child hood was spent craving to try it so once I was in America it was one of the first purchases I made. Although after one sip I ended up giving it away and never thought of it again. I don&apos;t remember what it tasted like or why I didn&apos;t like it, but all I remember was my opinion of Americans had changed. Fast forward some years later and the opportunity to try it has come up and my husband was so excited I could not say no. Once receiving my box of goodies he picked it up and asked if I was sure it was the Dr Pepper he has seen on tv as the packaging looks way different to what he has seen. He had expected it to look more like a coke can with the backing being red but this was more stropped with the Dr Pepper highlighted with a red background. I assumed it was the same and told him &apos;look its made with sugar so it must be the right drink&apos;. Smelling it reminds me of cherries or a lolly I had when I was younger but can not quite put my finger on it, it actually smells devine. It tastes surprisingly just like it smells and I did mind the taste at all. Its sweet and very fragrant. I know my taste buds have changed majorly since having kids and things I used to hate I not enjoy so I am not really surprised by the response that I had. The more I drank it the more I liked it. Funny my husband was not a huge fan as he found it a bit too sweet for his liking where as I loved it. For some reason I expected it to be a red colour but it looks just like Coke Cola, just not as fizzy, it was more smoother. I have to say I am really surprised by my reaction to this drink and I could easily happily drink it again. 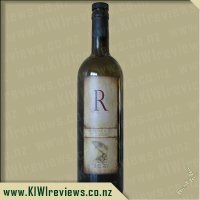 I think the price is fantastic and where as I would not gulp it down like coke, I found I enjoyed having a sip every once and while as it was rather satisfying. The can ended up lasting most of the night as just that little taste was all I needed. Really enjoyed. When I was a young impressionable teenager, I had a friend who had just come back from America. They raved about all these things that I had merely heard of on TV or films. Occasionally they would have some pumpkin pie or corn nuts to share with us uninitiated. The one thing they missed the most was Dr Pepper. As a result, we would go on missions to out of the way diaries if even the hint of a rumour suggested Dr Pepper could be found there. I got quite a taste for it, and even though it was hard to find it was worth the effort. To me it tasted like a cross between cola and root beer. As I like both of those things, the original flavour was a winner. When I saw this green can of Dr Pepper I was intrigued. I very much prefer cane sugar in my fizzy drinks. Corn Syrup is the sweetener of choice in most American products, because they have an over-abundance of corn. It&apos;s not terribl tasting, but I just think cane sugar is superior. I don&apos;t really trust artificial sweeteners and I don&apos;t consider sugar the ultimate evil. So I was keen to try this drink and hopeful that the change from corn syrup to cane sugar would be a huge improvement. The difference in taste between original and cane sugar were noticeable. I felt like the cane sugar almost muted the flavours I expected in a can of Dr Pepper. That was disappointing, because I really wanted to like this drink. Most of the point of drinking Dr Pepper is because of the flavour. 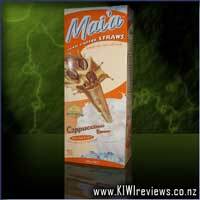 I suspect that if had it a bit more often I would become accustom to the cane sugar version and would enjoy it more. I&apos;m prepared to make that kind of sacrifice so I will be buying this again. When my review goodies arrived, I was so excited to try a much loved American drink. From the start, it looks like Coke...but certainly does not! It has it&apos;s own strong flavour, and very unique smell. The first look was very appealing, as retro style can which looks fun and inviting to try. From opening the can, it was bubbly and fresh, but not overly bubbly when first opened so was able to taste the flavour and not get overwhelmed by the bubbles. There was a definite zing in that first mouthful! The initial mouthful is a very strong taste which sadly does not appeal to me, and I wasn&apos;t keen on the after taste either. 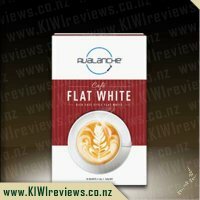 I was unable to pin-point exactly what the taste is similar to in NZ, possibly like cherry cola? The smell made it hard to keep drinking it, as it wasn&apos;t too appealing to me. It sadly was not a drink that tickled my taste buds too much, but certainly something worth trying. 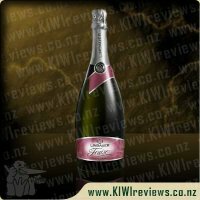 In terms of value for money, the price is very comparable to NZ cans in any market. While I won&apos;t be buying again for me, I would buy for others to try, especially those who like something a bit different. I was dying to try the Dr Pepper drink as I&apos;ve heard it mentioned over the years on American TV shows and movies and I&apos;ve never seen any in New Zealand. When the can arrived for review, I was surprised by the really unflattering can colour, a light green mixed with red accents? What an unusual mix, it really could do with some better art work to make it more appealling. I not sure what I was expecting for taste, maybe similar to Coca Cola with extra spice, like the name suggests...pepper? I poured the drink into a chilled glass and took a big inhale of the scent as I poured it, the look and smell was initially not unlike Coca Cola but then I smelt a fragrance that I couldn&apos;t quite get my finger on. Was it vanilla? Um no, that wasn&apos;t it. I took the first sip and then the taste was equal to the smell. Now that got me thinking...what is it? Just then, my 11 daughter then entered the room all excited that I had &apos;finally&apos; opened it (like one day after I received it; once it had chilled) and was eager to taste it as well. We shared the glass and she commented on the same sweet taste. 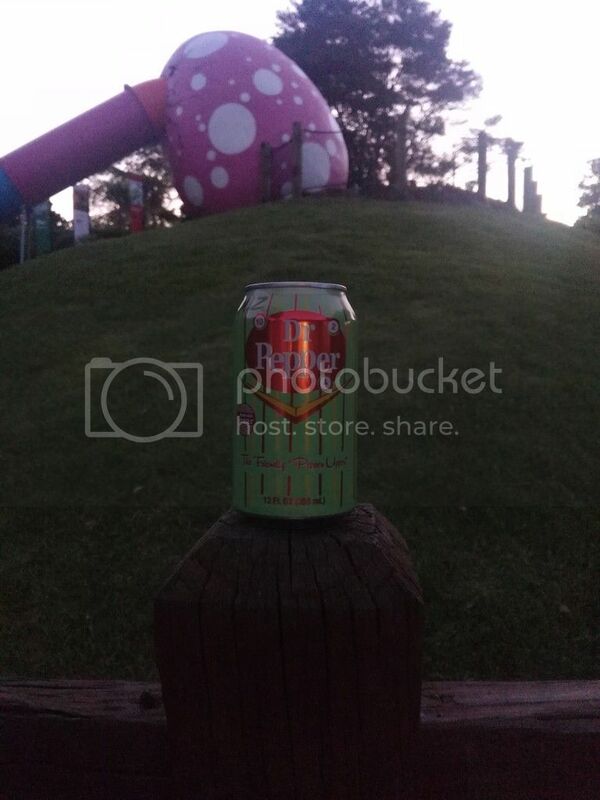 Then I began to think while I enjoyed the rest of the can. I finally worked it out, the taste is almond Christmas Icing, the only icing as a kid you generally actively tried to avoid but as an adult you come to quote enjoy. The drink was very different to what I was expecting and I think I liked the fact that it was, it made it new and quirky. However, I really think it is a drink suited to adults for solely the almond flavouring alone. While it wouldn&apos;t be my first choice, I would buy Dr Pepper again and I think the price is quote reasonable considering it is imported. When I was a kid my dad once bought a can of Dr Pepper and split it with me (it was very hard to find at the time) and I liked it, though I wasn&apos;t a huge fan. A couple of years later I saw it in a shop and gleefully bought a can and loved it, so when I spent seven months in America, so Dr Pepper was a go to drink (and I loved the link to my American father at the time). I didn&apos;t drink much when I came back, due to lack of availability, but it seems to be gaining some popularity and so I&apos;ve been buying more and more, so seeing this new variety I just had to try it. The green can didn&apos;t quite feel right for the brand, I know it would be aiming at the use of real sugar cane but it just didn&apos;t jibe with the long term dark red of the brand. I was dashing out the door and threw this in my bag to have whilst at the zoo with the kids. As it was, it ended up spending a few hours in my bag before I remembered that it was there and so I pulled it out to have a drink while the kids played on the slide. My first thought was that it still tasted pretty much like all the regular Dr Pepper drinks that I&apos;d had but it didn&apos;t seem quite as sharp or strong in flavour. I like that this uses real cane sugar, but I did feel it could have used a little more zing to it in comparison to the usual drink. It might take a little getting used to the slight flavour difference but I did enjoy this and would drink it again. One of my students who used to help review some of the teenage fiction I was allocated last year called to return some books today so I persuaded her to sit down and help me review a rather different product: a canned soft drink which was sitting on the table. I always prefer to review this type of product with at least one other person&apos;s input so her visit was fortuitous. At nearly 17, she has firm ideas on the sort of snack food and drink she prefers and it is useful to get a teenager&apos;s viewpoint. I had chilled the can and only just taken it out of the fridge, so I poured two glasses and we sat down to enjoy it. The day was perfect, hot and muggy, so a cold drink was just right for the occasion. I sniffed the contents of my glass before trying it; she went straight for the kill and took a long draught. I sipped mine tentatively; then, as I realised I did quite like it, I had some more. I had had a Dr Pepper once before, but it had been at least two years ago so I did not really remember the flavour. Having dealt with the worst of the day&apos;s heat by draining our glasses, we settled to compare notes. I thought it tasted like cherry cola with vanilla added, but she said it reminded her of marzipan on a Christmas cake and smelled really strongly of almonds. We could not agree: it was almost as though we had totally different experiences when we tasted it. However, her one negative was that she thought the "marzipan" flavour was too strong and she would prefer it to be less intense. My own reaction was that I quite liked it but it is very sweet so I don&apos;t think I could manage more than the half-can I had poured for myself. I think this drink, for me, would come into its own on a hot day when I was doing manual work and needed an energy boost as well as something to cool me down. The can takes pride in stating that it is "made with sugar" and "contains caffeine". Sugar is often seen as a bad word these days as is caffeine, but there is a place for them and sometimes they are preferable to some of the other chemicals that go into designer soft drinks. I guess the most important thing is moderation. Personally, I would buy this product as I quite like it, but I would aim to have a friend around that I could share it with, and it would be an occasional pick-me-up, not a daily tipple. Being a non coffee or tea drinker, I do enjoy a nice glass of a carbonated beverage on most nights of the week. Not the healthiest of choices, but I figure there are worse things I could have! Dr Pepper is one that I have heard of, thanks to the many American things shown on our television here in NZ, but is something that I have never tried. For some reason I had in my mind that it was something cinnamon, but how wrong could I be! After receiving my latest review parcel I put the can in the fridge and headed off to my Zumba class. I knew that it would be nice and refreshing after returning home. Once home I got it out of the fridge and settled in on the couch ready for a little bit of tv before bed. As I pulled the wee silver tab I heard the satisfying sound of a full of fizz can being opened. I knew this meant the can was still going to be nice and fizzy, despite having been sent via courier to me. As I took a sip my mind very quickly went to Cherry Cola, one of my favourite drinks. This was very pleasant, but I was also wondering just what else it reminded me of as cherry cola wasn&apos;t the only recognisable flavour in it. Upon coming online to write this review I decided to read the two reviews below mine. 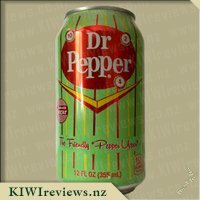 While reading one of the reviews I realised just what the other flavour was that the Dr Pepper reminded me of. That is, the almond icing on my Nana&apos;s home made Christmas cake. Only good memories from one of my favourite foods! I handed the can to my husband who tried it and liked it just as I did. Thankfully for me he had one sip and even though he liked it, knew it was one of my favourite flavours and let me finish the can! The can disappeared quite quickly, and I was left wanting even more. I will have to make sure to place an order through International Foods to get more. I had heard about this drink before - in movies, during a number of trips to the US, from people who had tried it - and I admit I have been really curious but never quite brave enough to try it. So when this opportunity came along, I had to take it up and do it right. Popping the can in the fridge overnight, I cracked it open this morning and took a swig - for the life of me the first thing that came to mind was marzipan icing - that almond-like taste you get when you scoff a chunk of that yellowish icing that sits between the cake and the white fondant on seriously fancy cakes. (A memory from my childhood, when my mother was a cake decorator for a time.) The second thing that came to mind was a vague memory of "cherry coke" from many years ago on a trip to the USA. The second memory almost triggered a reflex to spit it out, but I pushed through and kept drinking. After the second or third mouthful - can&apos;t be sure exactly which to be honest - I found I could enjoy the taste, but I must be honest and say I didn&apos;t *love* it at all - not the way I enjoy say a Blue V or an ice-cold glass of Coca-Cola now and then. Still, that is to be expected I guess, with odd almond/cherry memories tainting the experience. Wanting to be thorough, I left the can on my desk for half an hour, carefully sealed to keep in as much of the fizz as possible, to rise to room temperature. I find this often changes the flavour profiles as the lighter, more volatile, flavours start to come through quite early in the taste profile. Sure enough, almond/cherry notes hit my tongue as soon as I got some in my mouth, and that was enough for me. 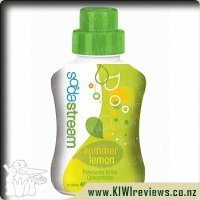 Overall, not my thing, but I can easily see that there is a good market for this drink - it&apos;s something different in the Kiwi marketscape, it&apos;s not readily available in supermarkets so the &apos;cred&apos; value of being seen slugging back a can is going to appeal to a certain market demographic, and I can very easily think of some interesting mixers it would go well with, though I would never taint a good bourbon by mixing it with this - the cherry notes would go OK, but the almond would be too jarring. Dr Pepper was something I first came across in America, it was everywhere in restaurants, supermarkets and in all fast food outlets where you could get it unlimited in self serve drinks, to tell you the truth I was never game enough to try it out for myself as the name put me off, being not much of a fan of pepper or spices why would I possibly want to drink something that contained pepper? So a few months age I was out with a friend who stopped at a dairy to buy a drink, she came back with a Dr Pepper and was in hysterics when she heard that I thought the drink actually contained pepper! So when the opportunity arose to review and try out a can of Dr Pepper I decided to take a chance and requested it, I must say I am so glad that I did as it tasted really good, and nothing like pepper. The taste is unique and in my opinion it tastes slightly like a cola drink, but with hints of both cherry and vanilla, it is absolutely delicious. This particular can of Dr Pepper is slightly different to the original cans of Dr Pepper that are more commonly found in that this green can contains real sugar cane as the sweetener, whereas the more common Dr Pepper contains high fructose corn syrup. The drink is definitely a very sweet caffeinated drink which was enjoyed by both my partner and myself. After quickly drinking the review can of Dr Pepper straight out of the fridge, I sent my partner to International Foods the following day to get us some more, as it went down nicely on a hot summer&apos;s day. 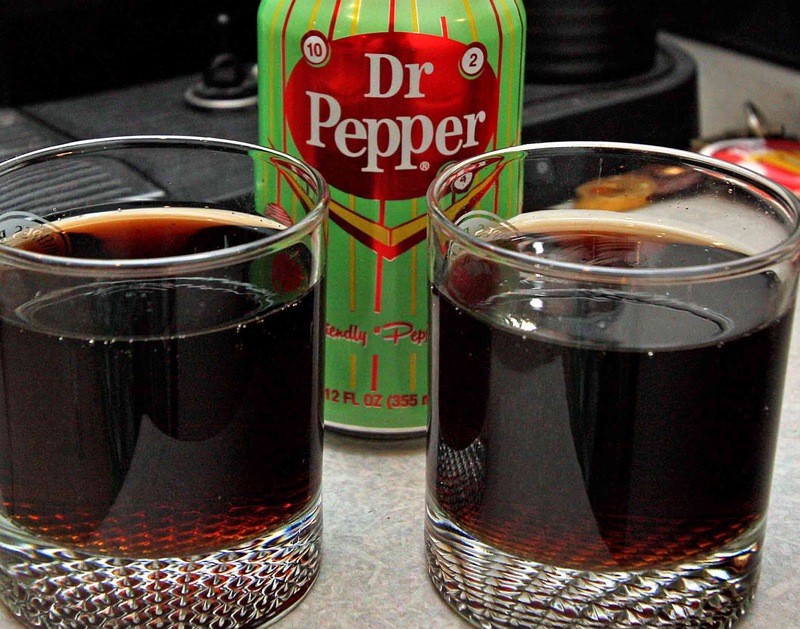 As he returned with several can&apos;s I decided to put my thinking cap on and think of some other ways in which to use the product, we decided to use some to make spiders, simply by pouring 1/2 a can of Dr Pepper into 2 glasses and then adding a dollop of vanilla ice cream to each one, delicious. I also used one can to add to a chocolate cake recipe which I often make which calls for a can of Coke, however this time round I decided to use Dr Pepper, this worked really well and did seem to provide a slightly sweeter flavour all round. Dr Pepper is something which I most definitely will be continuing to buy, it is a great drink for on a hot summer&apos;s day and a fantastic alternative to Coke.